(NaturalNews) Many people know that flax seed is a good source of omega-3 fatty acids and will be happy to know that they have another available source in the chia seed. This tiny seed has many advantages over flax; it doesn't need to be ground to access the nutrients, and the seeds can be stored for long periods of time without deteriorating. 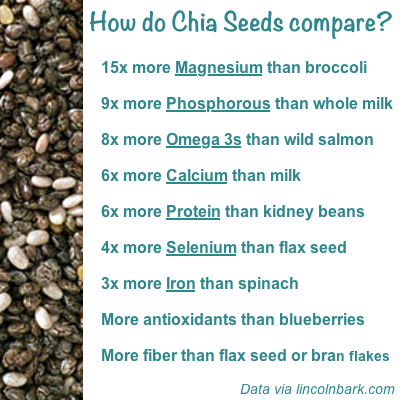 Chia is rich in omega-3 fatty acids, even more so than flax. The ALA (alpha linolenic fatty acid) that is in chia seeds is the only known essential omega-3 fatty acid that the body can't produce on its own. Omega-3 is found in foods such as chia seed, flax seed, flax oil, olive oil, walnuts, fish, kale, spinach, cauliflower and broccoli to name a few. Chia seeds provide the body with protein, vitamins and mineralsChia also provides the body with vitamins A, B, E and D and minerals such as calcium, copper, iron, magnesium, manganese, molybdenum, niacin, phosphorous, potassium, silicon, sodium, sulphur, thiamine and zinc. Chia seeds are also a wonderful source of protein. Proteins are the building blocks of the body, hair, skin, nails, muscles, red blood cells, as well as essential and non essential amino acids and fiber, all of which are necessary for good circulation and a healthy heart. Chia seeds also help to modulate blood sugar, which is wonderful news for diabetics. When it comes to fiber in our diets we are all lacking. By simply adding one ounce (2.75 tablespoons) of chia to your diet, you are adding 11 grams of fiber. • As an egg substitute in baking: Add a tablespoon of ground chia with 3 tablespoons of water, per egg in a recipe. • Mix with flour and seasoning next time you are making a breaded fish, chicken or veggie dish, it will add a wonderful nutty flavor and crunch. • Make a chia gel. To make chia gel, place 1/3 cup chia seeds into an air tight container, add 2 cups of water, and whisk briskly. Let the mixture sit for 5-10 minutes, and then whisk again before placing into the refrigerator. The mixture will turn into a gel, and will last up to 3 weeks if refrigerated. The gel can be incorporated into jam, cereal, yogurt, smoothies, or any other foods for consumption. 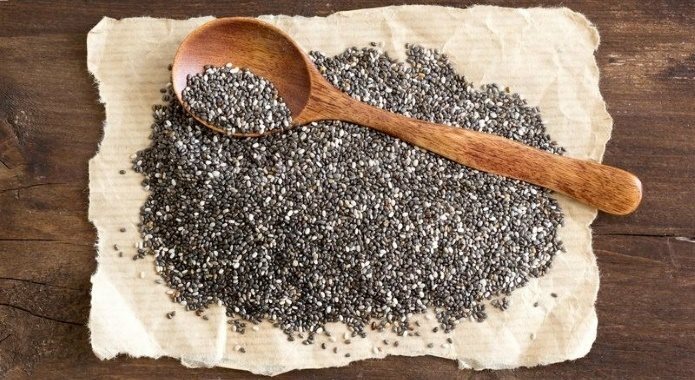 These Are 7 MOST Important Health Benefits of Chia Seeds! These Tips Helped Over 19,000 Readers! Chia seeds are the talk of the town in the health industry. While you may have only heard of these within the last few years, they have been around for centuries. In fact, ancient Aztec warriors relied on this food for sustenance and strength. In the Mayan language, Chia means “strength.” The nutritional content of this tiny little seed is said to be able to sustain a person for 24 hours with just one tablespoon. If you’re thinking of adding chia to your diet, here are seven benefits that you need to know! Chia seeds can improve cardiovascular health and promote good cholesterol. These seeds are full of omega-3 fatty acids that cannot be synthesized by the body and are an essential part of a healthy cardiovascular system. What is more, these seeds also contain Vitamin B3 (or Niacin) which helps promote healthy cholesterol. According to the Mayo Clinic, niacin can raise HDL-cholesterol (the good kind) by over 30 percent. It does this by traveling through your bloodstream and picking up any excess bad cholesterol. It takes it directly to your liver where your body can dispose of it. Chia seeds are a super low-carb food. Just one ounce (or two tablespoons) contains two grams of digestible carbs. Technically, it contains twelve grams of carbohydrates, but ten of those are just fiber, which is not digested by your body. What’s the fuss about this substance anyway? Foods that are high in fiber help keep you feeling full for longer. Just sprinkle two tablespoons on your morning cereal or yogurt to combat those mid-morning hunger cravings. The high amounts of fiber in chia seeds can also help you fight or prevent diabetes. If you were to place a spoonful of these in a glass of water, it would turn into a gel-like substance after approximately 30 minutes. This happens with the same effect in your stomach. This gel-like substance creates a barrier between your digestive enzymes and the carbohydrates you consume. As a result, your body takes much longer to break these down, slowing the process of turning carbs into sugar. This helps keep your blood sugar levels under control. Vuksan, V., et al. (2007). “Supplementation of conventional therapy with the novel grain Salba (Salvia hispanica L.) improves major and emerging cardiovascular risk factors in type 2 diabetes: results of a randomized controlled trial”, in Diabetes Care, Vol. 30(11). Reduced appetite – Their high fiber content makes you feel full. As a result, you consume fewer calories. It also improves your digestive system, which assists you in eliminating toxins and waste more efficiently. Protein rich – Two tablespoons contains up to 4.7g of protein – a substance that increases muscle tone and strength. The more muscles your body has, the more calories it burns during your rest time. What is more, these seeds are low in carbohydrates and stabilize blood sugar levels. This helps limit the highs and crashes experienced when eating sweet food, and can reduce hunger cravings. Chia seeds are an excellent source of antioxidants. In fact, these are so rich in those substances that they do not deteriorate and can be stored for extended periods of time. Antioxidants help fight free radicals in the body, keeping you healthier and younger. Toxins and free radicals damage your cells and not only contribute to disease but speed up the aging process as well. Antioxidants can also minimize inflammation and that way improve arthritis, reduce your chances of developing diseases like heart disease, cancer, IBS, stroke and even Alzheimer’s. Did you know that just one ounce of these seeds provides you with 18% of the recommended daily amount (RDA) of calcium? This mineral is essential for healthy teeth and bones. Gram for gram, chia seeds contain more calcium than most dairy products in your grocery store. If you can´t eat dairy products, then these seeds are an excellent alternative source of this mineral. They also contain magnesium, protein, and phosphorus which also help keep your bones healthy and in good shape. Chia seeds are a fantastic source of protein that is vital to so many of your body’s daily functions. It builds muscle, increases immunity, keeps your pH levels in check, creates enzymes and helps your organism to transport nutrients. Just two tablespoons of these seeds provide you with 4.7g of protein. Foods that are rich in protein are more satiating, leaving you feeling fuller faster and for longer and they help you build muscle. ​Chia seeds are so easy to add to your diet. Just mix them in with your morning smoothie or your post-workout shake for an extra dose of protein. Sprinkle them on top of your yogurt, cereal or even add them to your salad dressing. You can even make a pudding for a satisfying, healthy dessert!